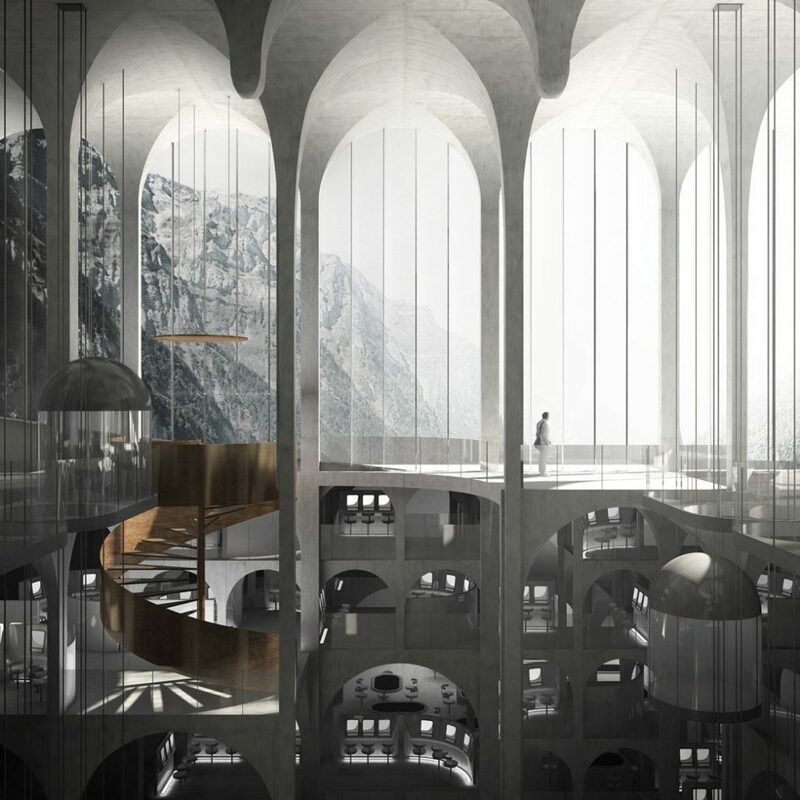 All-in project is a speculative casino that explores the infinite interior as a control mechanism. 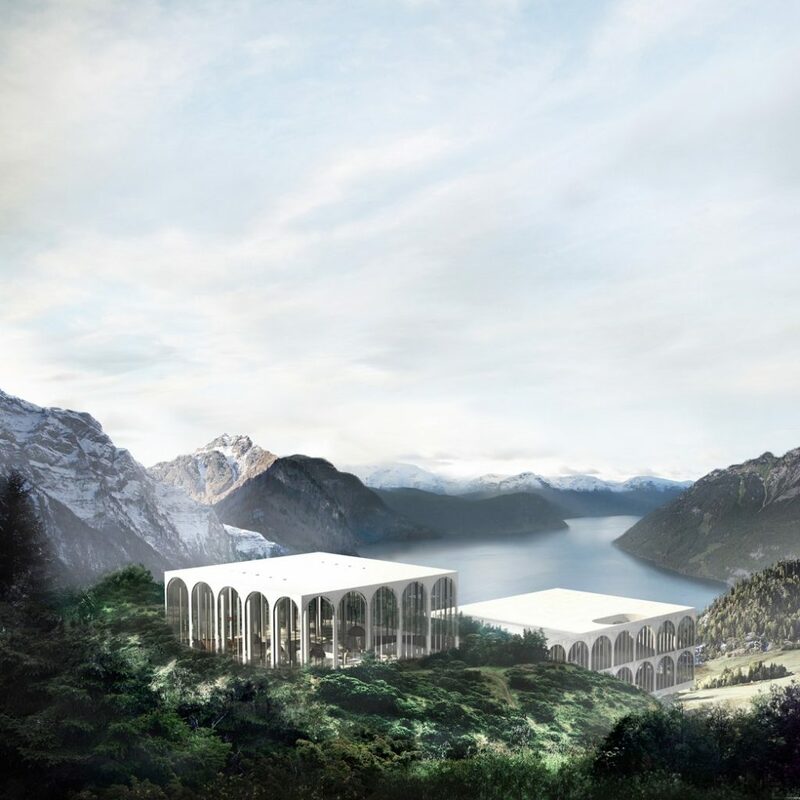 The programmatic complexities of such a resort offer a set of rules and a conceptual playground for architectural experimentation. The initial goal was to analyze and distill design guidelines of those facilities to understand their internal functioning. Parallel to that analysis, digital diagrams were developed to express in abstract forms, keys concepts to the organization of casinos such as repetition, accumulation and modulation. 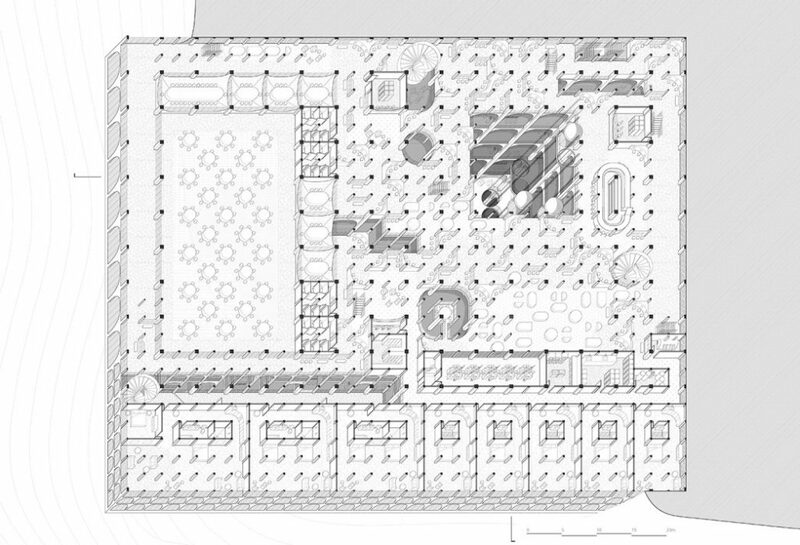 As a result, the multiple functions articulating the gaming floor evolve within a single grid system. With the intention of keeping users as long as possible, the architectural system must not allow users to completely grasp the complexity the organization while giving them a sense of familiarity and comfort in each section. The underground construction and the shifting floor plates contribute to a misleading reading of the space by the visitors by suppressing visual reference. By playing with the dimensions of the base module on a monochromatic material palette, the subtle variations make self-localization harder within the environment. 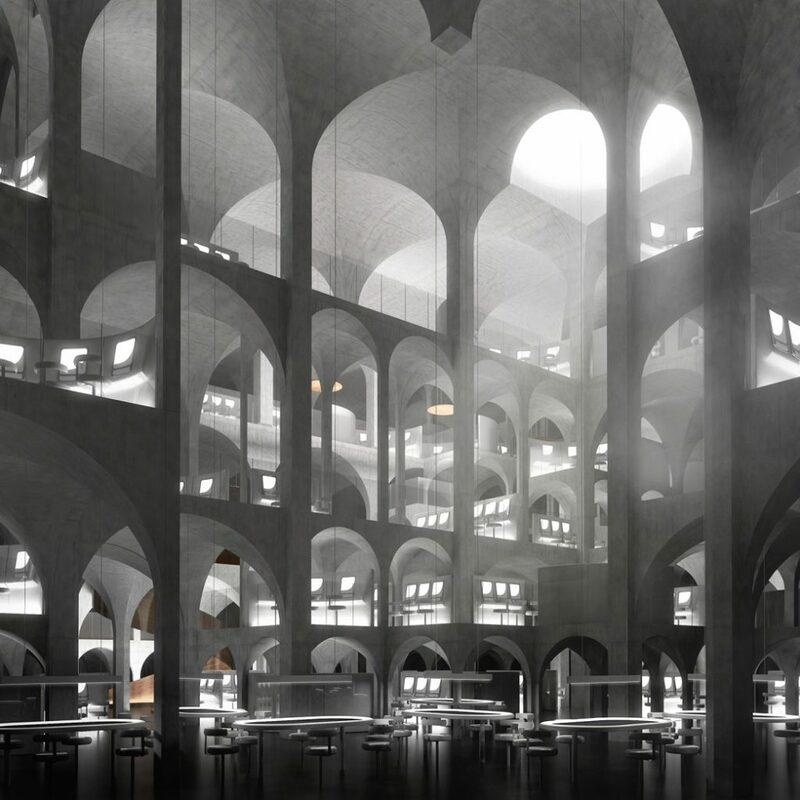 Rather than being used for its symbolic evocation, the vaulted base unit emerged from the experimentation process going from diagram to model making and was kept in the project for its spatial richness, and its modularity. 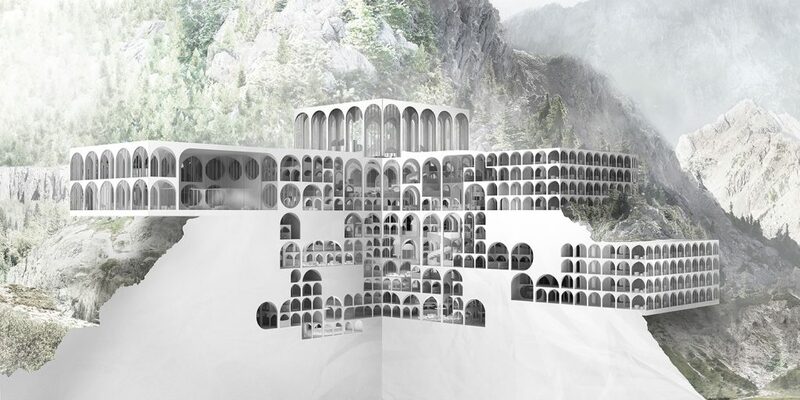 The thesis started as an investigation of digital explorations mixed with programmatic constraints of an overlooked typology and ended up unfolding into unexpected spatial qualities half dug in a mountain side. Who influences you graphically ? The group of Possible Medium triggered some reflections with their discussions on representations and its impact of the project. They were exploring, in part, orthographic and axonometric drawings and the multiples possible readings that they can produce. This multiplicity led to further investigation on perceptions and the manners by which that can be manipulated. Young & Ayata were also influential for their work on drawings and/or painting and/or rendering. Their aesthetic approach on ambiguity of reading and the line between familiar and unfamiliar was important in the process. Also, in the making of the drawings and images, Piranesi, Boullée, Ledoux were studied for their composition, line techniques and their ability to create a single piece that convey multiples intentions. Those references were mainly influential for their process and reflections rather than their given style. The images, although beautiful, appear as static – was this intentional? It was intentional in the sense that the project unfolded in an underground maze-like structure. 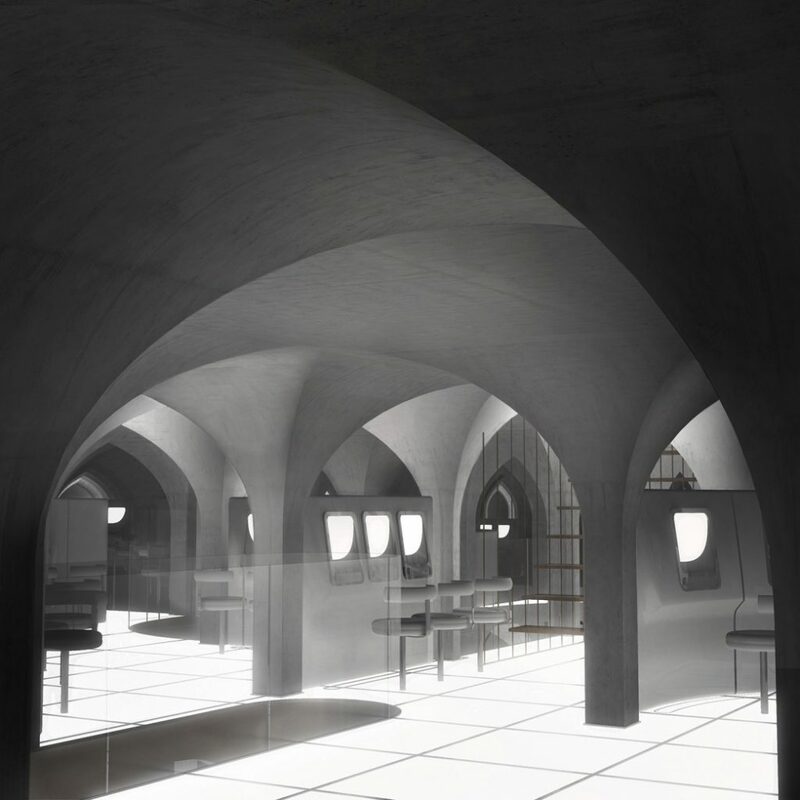 This interior was conceptually conceived has monolithic and dug out of a block of matter and therefore needed to be perceived as heavy, uniform and static to be coherent. 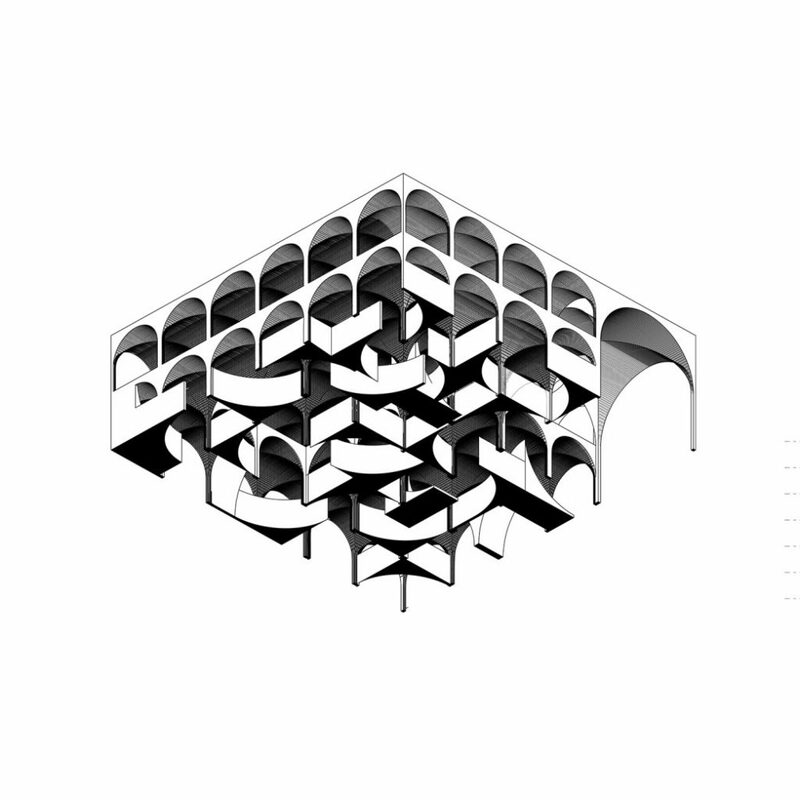 Parallel to that main conceptual goal, as the project developed, the modular arch became a flexible system for the project. Following that path, a static, quiet atmosphere was given to the images and to the whole presentation to focus on the visitor journey and its perception of its surrounding. You seize to show the vibrancy, frenetic and eccentric atmosphere of the casinos whys so? The sober atmosphere of the images is intentional to distance the project from the “glitter and gold” iconography of Las Vegas. That way, the focus is put on the space and organization rather than on the gaming equipment and the blinking lights. One of the goal was to understand the mechanic or the reasons behind the flashy appearance of traditional casinos and arranged them in architectural processes. Also, it was important to illustrate an interpretation of the experience of the casino as an individual and almost solitary experience, a relation between a player and its environment, and therefore making an abstraction of crowd and not show frenetic neon signs. How could the formatting of the proposal through a casino map/leaflet have helped in exploring the proposal further? The program of the casino was chosen in part because it is regulated and controlled by a set of rules and has clear organizing principles. But the most important aspect of this program is that those rules are intentionally hidden from the visitors. There is a game of power underlying this architecture regarding what is given explicitly or not. The visitors explore, wander to get lost deeper into the machine. Giving them a map would be counter-productive. Although, producing a leaflet for a casino project could have been an additional document to give misleading or contradictory information. What simplification could be made to the plan? What can be blanked, hidden or cheated on the map? What information is missing or purposefully exaggerated? A crooked map could have been a way of make the visitors more disoriented or confused. You explore this typology in an idyllic segregated space- how would the relate of a dynamic city change the way the proposal is perceived? It was a conscious choice to place the project in a disconnected natural landscape. As my understanding of the casino goes, it works as a machine to imprison the players, keep them as long as it possibly can. To create an isolated, independent world contribute the self-sufficiency of the visitors without the boundaries of the building without needing to go out and loose connection with the machine. Going at the casino is a sort if voluntary imprisonment. Another reason was that the thesis project presentation as an academic exercise can be difficult to managed. Based on my experience, a jury can drift to accessory subjects during a review. In the case of a casino program, many aspect can be problematic such as social, economical, ethical or moral just to name a few. This fictional landscape was voluntarily remote. I’ve decided to create a significant disconnection with a city context to avoid, as much as possible, those discussions and focus the jury on aspects that we’re intentionally developed. I acknowledge that they are indeed important issues to consider, but I felt that they could not be all addressed within a single thesis project. That being said, an urban context would have changed a lot of variants, the representation, the iconography of the institution could have been a theme developed with much more attention. What casino case studies/ references did you look to when developing the project? Where any other typologies useful in shaping you own unique casino? At an early stage, I wanted to study prison, shopping mall, airport. All those typologies are strongly organized by security and surveillance principles which have influence the behaviors of its users (subtly or not). I guess for privacy, security or confidentiality reasons, most drawings and technical data are hard to find in significant quantities or in an updated status. On the other hand, the amount of writings covering design approaches both methodically and conceptually was impressing. Authors like David Kranes, Norman Klein, Natasha Dow Schüll and Bill Friedman were important to draw the framework of the project. While analyzing those design methods, I also read on cognitive science, articles on behaviors or perceptions. How much attention is given to our surrounding environment? How much can it influence our behavior? How to we perceived space (consciously and not)? Is it possible to quantify the power and control an individual has over general or specific situations? Those were interesting readings and they probably influence to a certain degree the outcome but the project doesn’t pretend nor directly try to transpose scientific findings into architectural principles. How important was the diagram as a tool to process and rationalize the research? In this process, the diagram was a tool to expand the scope of the research rather than rationalize or define a narrative. It helped to test simple scripts, using a set of rules to organized, aggregate, deploy or transforms basic forms (either lines, cubes or mesh spheres). The output was catalogued and rules were changed to find a language or a system that can be used as an overarching principle for the project. After series of explorations in drawings, I transposed them and sometime reinterpreted them into physical model. Certain patterns and qualities were common to many of the diagrammatic models (that I was still considering as conceptual more than architectural). It was later in the process that the program became a way to constrain and hierarchize most of the internal organization and the external shape. Could you talk us through the process of going from the diagram to model making when exploring the vault? Moving from drawings to physical model was mostly made with the help of 3d printing and 3 axis cnc milling. In some cases, line drawings were transformed into pipes to get printed. In other cases, the lines were used as path for the milling tool to follow. Another approach was to orient (sometime randomly) objects to replaced aggregated cubes. It was an exploratory process to seek a promising system. The aim was that the outcome fulfills key concepts describe by casino specialists and authors of casino design. 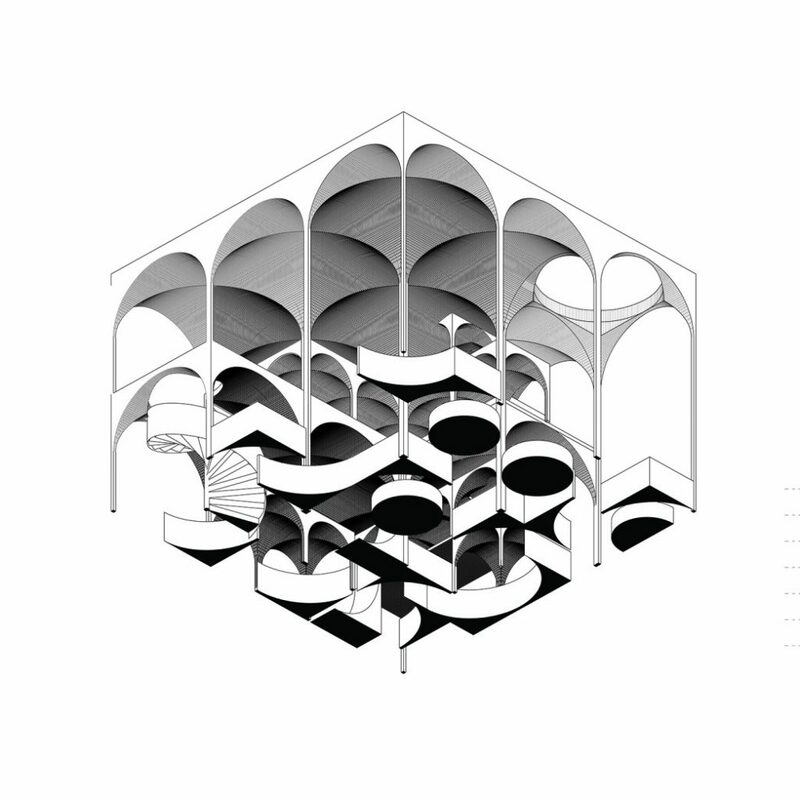 The vault shape emerged with one of those materialization of lines drawings. Considering material and machine constraint, I was subtracting matter following pattern based on a selected family of curves. The constraint of the 3 axis limits any undercut which gave the pattern spherical or semi-spherical shape. Then after stacking them back together, I ended up with a cave like pile of blue foam that was strangely appealing and full of potential regarding the program and the conceptual framework. In this regard, it’s not a super systematic process. It’s much more open ended. Sometime following a rigid ‘protocol’ and sometime trying or experimenting following intuition. In deeming it an overlooked typology, where do you see the future of casinos? and casino architecture? For the casino industry, I’m no expert so I cannot predict where it might go, but as design principles I think it’s a rich topic to explore. They’re a lot a branding projects, flagship stores or commercial complexes that are aiming at keeping their customers as long as possible. Therefore, a lot of principles used in casino that can be applied in commercial architecture. It is fascinating to realized that architectural decision can have that much impact (good and bad) on users or customers’ behaviors. I think it is important to have a better understanding of how architects influence (consciously or not) behaviors in order to make enlightened design decision. So, for the industry I don’t know but as design principles I thing that there still a lot to be study and quantify and it might have some broader uses.